and we go on a drive together in the country and share root beer floats. Sometimes life is disagreeing, misunderstanding, hurting each other, making up. (our daughter is pregnant for the first time in thirteen years of marriage). Sometimes life is a text from a loved one with heart wrenching news about one of her children. because it's the truest truth that God really is good. -an 86 degree day in April in Portland, Oregon! -our grandson spending the night with us because he told his mama that he "just needed a break"
Thursday post every Thursday since then, and I had never heard of Ann Voskamp until a blogging friend sent me her book about 2 yrs. or so out. Elizabeth, thanks for sharing the 'truest truth'--God IS good, all the time. Your photos always make me smile. Dear Elizabeth, I alway look forward to Monday mornings so I can read your post and see your beautiful pictures. My favorite today was the picture of your grandson and his comment about "needing a break". Yes indeed, God is good all the time! Thanks for sharing. P. S. What good movie did you watch? No matter what is going on, there's never a day without blessings. I've been counting since 2009 too! And the presence of Jesus- nothing is sweeter! Love your shoes and they look good on you. I love it when God gives us good bargains. Elizabeth, you are so right...even in the midst of confusion and uncertainty, there is always something to be thankful for. What a lovely post to remind us of that! I love your gratitude list, Elizabeth. For some reason the past week I've not been very good at writing mine down. I know God extends grace but this is really something I want to do. I can always tell the difference in my mood when I stop counting from when I'm counting. It really does work! Thank you for sharing with us. Even the simplest moment taken...slowed...a soft whisper of "thank you, Lord"...can make our days so much happier especially during stressful or frustrating times. He IS there, walking beside us, every single moment of our lives asking in his quiet voice, "Do you feel My love? Do you see what I've blessed you with today?" I love that! "Piling up gratitude"...love that phrase and your list! What joy!!! 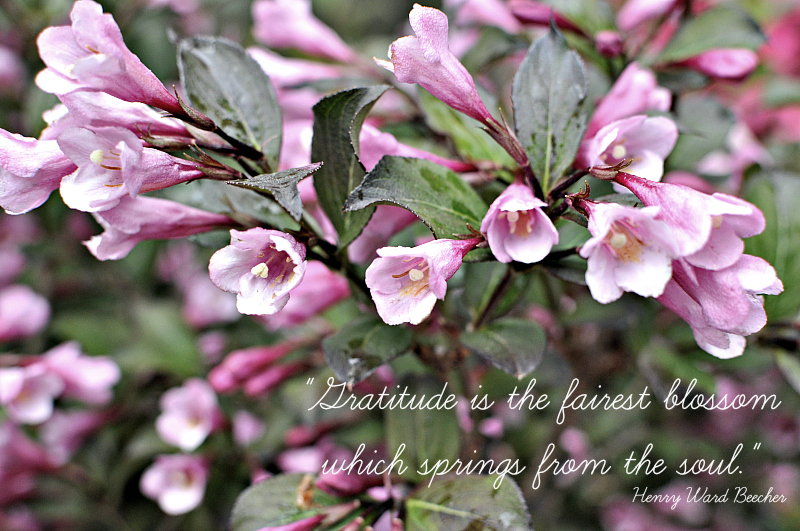 Thank you for sharing your gratitude list; you have blessed me and I thank you!! Love your pictures and the daughter expecting her first!! That indeed is such a grace from God. Lovely post and lovely pictures. Gratitude is a beautiful thing, thank you for sharing your list. So excited about your grandbaby to be--and after 13 years of marriage. And I do love your shoes! Happy Mothers Day!